This group of stratovolcanoes lies in East Java. Inside the crater, you will see a magnificent turquoise Sulphur lake that exudes flames, blue fire at night and smoky white in the day. 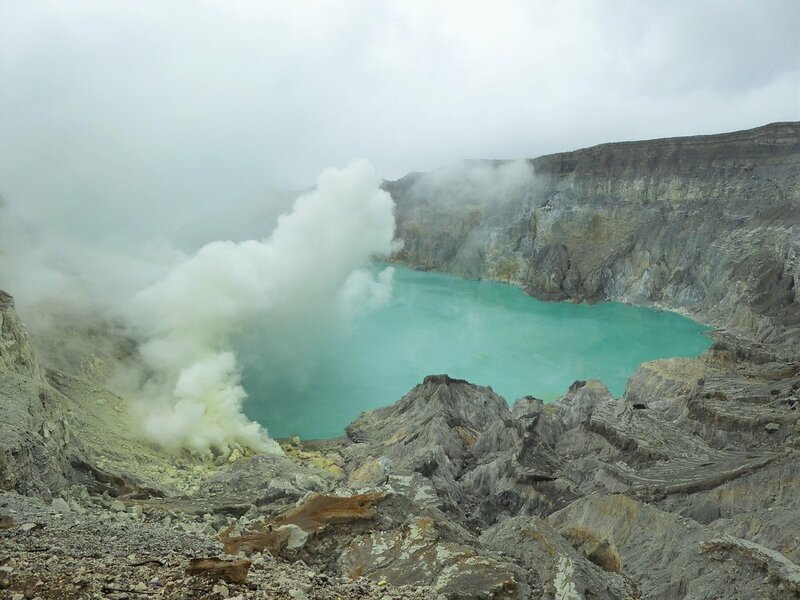 Here you will also find many Sulphur collectors that hike up here to mine the minerals of Kawah Ijen but this had been highlighted badly recently in the media due to the fumes being harmful to human and its extremely harsh working conditions. There are plenty of things to see - World’s largest acidic lake, which is in the brilliant turquoise color that captures not only the sunlight but every traveler’s heart.Catch the miners hard at work, carrying a heavily laden basket of Sulphur though you may be disturbed by it and feel sorry for them. Note in mind that the Sulphur fumes are poisonous and these miners are subjected to it daily for extended hard-labored hours. There are coffee plantations cover the Ijen caldera floor where many travelers head there to visit the waterfalls, hot springs or just enjoy the dramatic volcanic scenery. Hike Mount Bromo: Mount Bromo which stands tall at 2329 m is the most iconic and the most hiked mountain in Indonesia. It beckons majestically despite having the entire top blown off and with a crater inside that keeps spewing off white sulphurous smoke. Mount Bromo is still one of the most active volcanoes in the world and there are areas that are blocked off from tourists due to its imminent danger. It sits inside the massive Tengger caldera (volcanic crater with diameter approximately 10km), surrounded by the Laut Pasir (sea of sand) of fine volcanic sand. After an easy hike, travelers are awarded a breathtaking and ethereal landscape during the sunrise. Hike Mount Merbabu: This Mount is one of the most popular hikes in Central Java, and has spectacular views to other volcanoes in all directions from the summit area. It has five calderas, Condrodimuko, Kombang, Kendang, Rebab and Sambernyowo - but no serious volcanic activity has been reported here for many decades. Merbabu can be climbed from Kopeng (northern slope, near to Semerang) or Selo (southern slope between Merbabu and Merapi and closer to Solo), The best hike is definitely a traverse from Kopeng to Selo, because the climb from Kopeng is a gentler slope and there is a good source of water halfway up. This hike could be completed in a day by very fit people, but an overnight stay on one of the summits is recommended. This Acanela Expedition © is an adventure. Embark on this small group exploration and have hands-on encounters with local peoples and cultures, while experiencing all the historical & culinary highlights along the way. Private dates upon inquiry, but note that the best times to travel to Indonesia are April - October!